UC Davis patients avoided millions of miles of driving — and their associated financial and environmental costs — by getting their clinical care via videoconferencing, a new study by the UC Davis School of Medicine has found. 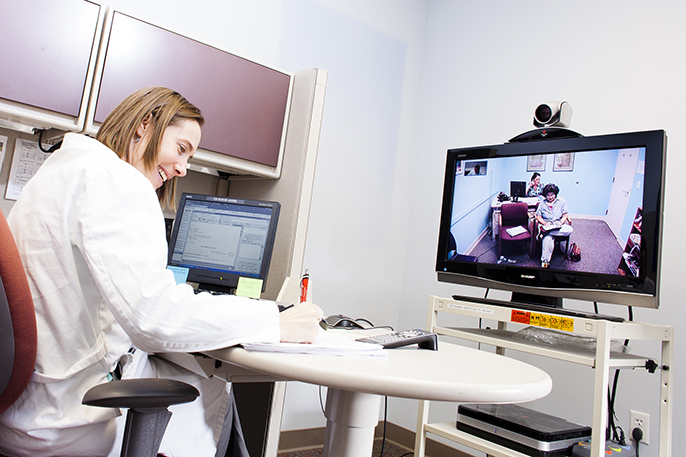 As a national leader in the use of telemedicine — broadly defined as videoconferencing between patients and clinicians in different geographic locations — UC Davis analyzed its own clinical records over the past 18 years to precisely measure the benefits of enabling patients to remain in their hometowns while meeting with physicians working at the university’s Sacramento campus. According to the researchers, by using telemedicine for clinical appointments and consultations, its patients avoided travel distances that totaled more than 5 million miles. Those patients also saved nearly nine years of travel time and about $3 million in travel costs. Savings estimates were based on patient travel to a telemedicine center near their home compared to the travel that would have been required had they come to UC Davis Health in Sacramento for care. The study also calculated the amount of greenhouse emissions that were likely avoided by reduced miles driven. The findings, “Impact of a university-based outpatient telemedicine program on time savings, travel costs, and environmental pollutants,” were published online in the journal Value in Health. “Our findings confirm the benefits of telemedicine in terms of real savings to patients and to the environment,” said James Marcin, the study's principal investigator and chief of the UC Davis Division of Pediatric Critical Care Medicine. Marcin, who also serves as director of UC Davis' Pediatric Telemedicine Program, explained that most studies that evaluate telemedicine programs have focused on cost savings to the health care system. This is the largest study that he is aware of that considers cost and time savings from the patients’ perspectives, as well as environmental impacts. The investigators evaluated data from the UC Davis telemedicine program for 19,246 outpatient and inpatient interactive video-based consultations from July 1996 to December 2013. They found that for an individual consultation, the mean savings to a patient were 278 miles in driving, four hours in time and $156 in direct travel costs. Overall environmental impacts were calculated to be nearly 2,000 metric tons of carbon dioxide, 50 metric tons of carbon monoxide, 3.7 metric tons of nitrogen oxides and 5.5 metric tons of volatile organic compounds. UC Davis has been a pioneer in the use of telemedicine to increase health care access for underserved patients living in areas of the state far from specialty medical services, with the program starting in 1992. More than 30 clinical specialties are now involved, serving patients in more than 150 locations in 56 out of California’s 58 counties. Typically the patient and his or her primary care doctor are together in a room while consulting with a UC Davis specialist. This allows the primary care doctor to facilitate the interaction and also provides the primary doctor with education in specialty care and managing the patient’s health. Marcin pointed out that in the early days of the study period, telemedicine equipment – allowing interactive visual and audio communication with a remote physician — was expensive and only available to patients at locations such as community hospitals or clinics. Now that such capabilities are widely available, telemedicine can be conducted in doctors’ offices or even patient’s homes, increasing patient cost savings and convenience as well as environmental benefits even more. The value of telemedicine is sometimes questioned based on its departure from traditional patient care involving face-to-face contact with the treating physician. According to Marcin, the program is most beneficial for specialties that rely heavily on talking (such as mental health services) and laboratory services (such as endocrinology), and is less used for specialties such as orthopaedics that involve extensive physical examination. Overall, he is a strong advocate for telemedicine from a public health standpoint. Marcin’s research group is now focusing on comparing health care services and outcomes for patients who use and do not use telemedicine. Other UC Davis study authors were Taylor Kaufman, Jamie Lissee, Jesse King and Madan Dharmar. Co-authors Navjit Dullet is with Touro University California, Estella Geraghty is now with ESRI and Anthony Smith is with the University of Queensland, Australia.